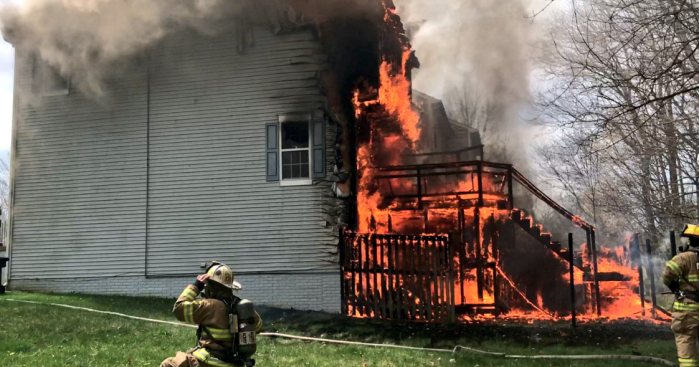 Eight adults and a child are without a home after a large fire tore through the rear of a Largo, Maryland, townhome and damaged three nearby townhomes, Prince George's County fire officials say. Nine people are without a home after a large fire tore through the rear of a Largo, Maryland, townhome and damaged three nearby townhomes, Prince George's County fire officials say. Firefighters were called to the 11500 block of Dunloring Drive about 12:30 p.m. Monday. When they arrived, they found fire coming from the back of a townhome. Additional firefighters were called to the scene when the fire began to spread to adjacent homes. Fire officials say four townhomes were damaged in the fire. The flames melted the siding on some of the homes. One firefighter was taken to the hospital with minor injuries. No other injuries were reported, but officials say eight adults and a child were displaced by the fire.